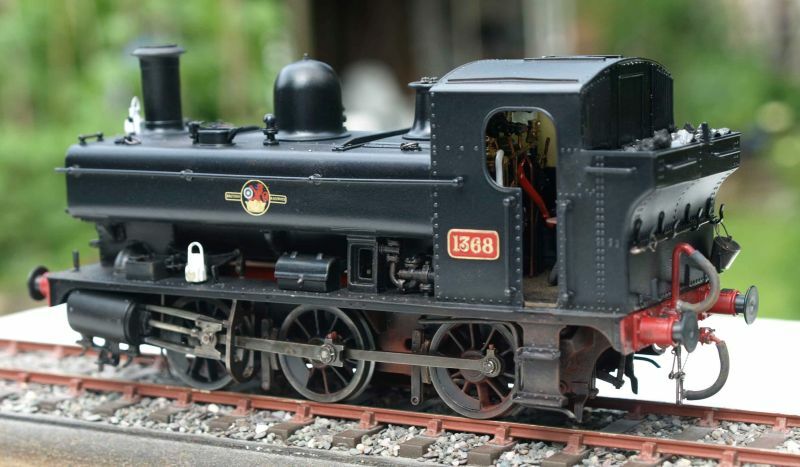 Ted Kanas' outside-cylindered dock tank 1368, in post-1957 unlined black livery. It was very rare to see a red background numberplate at this late stage with the late crest, but it is correct. 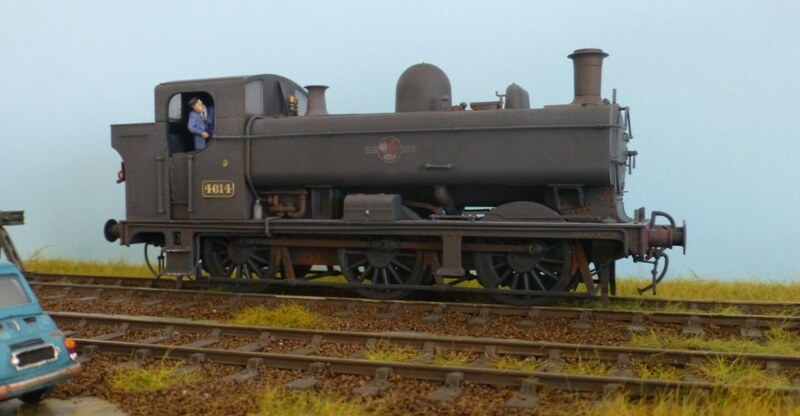 The following notes are something of a departure for this site, namely to address what happened after nationalisation, but they are included here to reflect the growing popularity of that era with modellers. The livery changes can be seen to be roughly divided into two short eras, 1948–56, and 1956 to 1965, when Western Region steam came to an end. The liveries in both these eras show rapid change, are not always logical, and the variations described endorse the old adage of following only a dated picture if historical accuracy is to be observed. Thanks are extended to members of RMweb for help in compiling these notes. Following nationalisation on 1 January 1948, Kings, Castles and Stars continued to be outshopped in lined green livery, in much the same previous style, but there were differences in lining style, as detailed below. Experimental liveries appeared in 1948 on some express locos: lined apple green, and lined dark blue for Kings 6001, 6009, 6025 and 6026. The lined apple green experiment was confined to Castles – 4091, 7010, 7011, 7012 and 7013 painted from new, with 4089, 4091, 5010, 5021 and 5023 receiving the livery following works overhaul. Kings were painted in a lined lighter blue livery from 1949, but they began to revert to green from 1951. Other than Kings, Castles and Stars, classes that were lined previously in GWR days began to be outshopped in a 'mixed-traffic and secondary passenger' lined livery, which first started to make its appearance in 1949. The classes involved were therefore Halls, Counties, and those Saints (2920/6/7/34/7/45/7/9/54) receiving works repaints before the class finally disappeared in October 1953. In addition, the ten BR-built Manors received the livery. Body colour was black, and lining on tanks and tender sides was a ⅝" outer pale dove grey band adjacent to which was an inner ⅛" cream band, inside which was a ⅛" red line. Lining on boiler bands and cylinders was two ⅛" red lines. It should be noted that this livery era lasted only from 1949–56, and some Halls (e.g. 6990) carried their pre-1949 lined green livery right through to 1956, when lined green livery was re-introduced, so never received the lined black livery. Prior to 1949, it is thought some large Prairies appeared in unlined green. 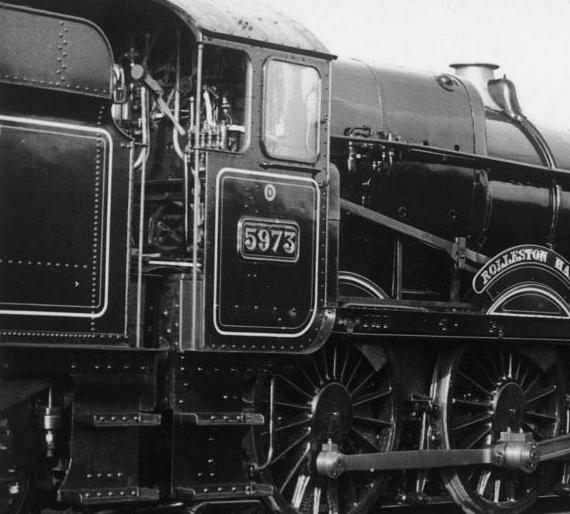 All locos other than Kings, Castles, Stars, Saints, Halls, Counties and the 10 BR-built Manors (7820–29) were outshopped in unlined black. 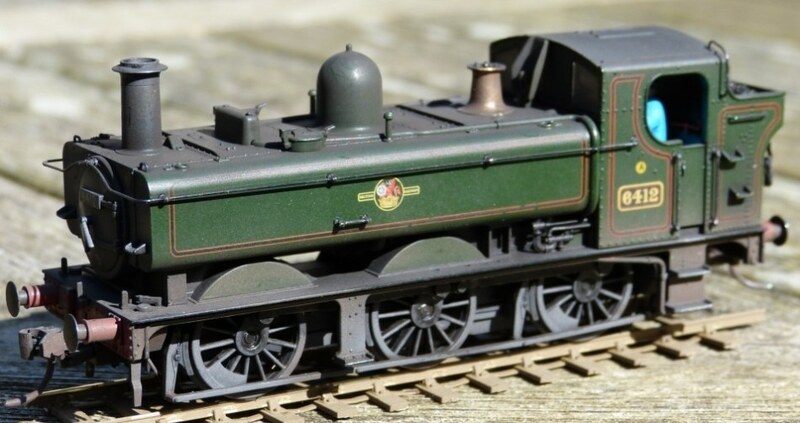 7804 Baydon Manor received unlined green with no emblem on the tender in 1948 for pilot duties over the south Devon banks. Between 1952 and 1954 it received unlined black with early crest, probably at the same time as the blastpipe modifications. 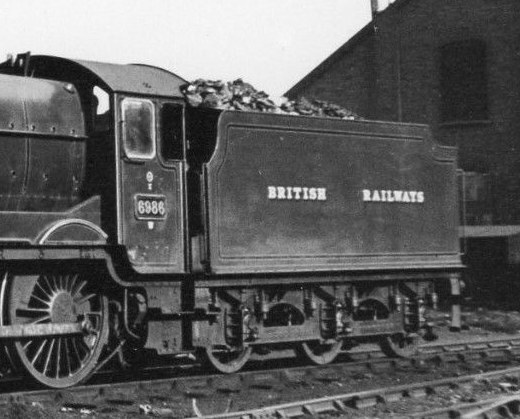 The BR-built Manors, painted in lined mixed traffic black with the early crest when new, reverted to unlined black with the early crest during 1952–4 (probably at the same time as the blastpipe modifications). For the less-distinguished classes, there were exceptions to the general application of unlined black. 0-4-2Ts 1411, 1417, 1465, 1470, 5816, Collett Goods 2213, 2238, Dean Goods 0-6-0 2529, 2-8-0 4702, Panniers 1503–5, 5409, 8762–4/71/3, Moguls 5370, 7313, 9314, Dukedogs 9009 and 9014, small Prairies 4406, 4409 (with BRITISH RAILWAYS insignia), 5527, large Prairies 4116, 4166, 4171, 5156, 5173, 5190 were in lined black. Two Granges were also outshopped in the lined mixed traffic livery, thought to be 6809 and 6819. For locos in plain black or lined mixed-traffic black livery, the background colour of nameplates and numberplates was painted red from November 1949. This practice ceased in April 1952, when the background reverted to black on official repaints. It is likely however that the red was perpetuated beyond the 1952 date by some running sheds or works, and some engines could still be seen with red-background number plates up to 1960/1. In 1956, green was re-introduced for certain loco classes, but its implementation was not straightfoward. The first 1956 instruction regarding application of green livery (either lined for certain mainline passenger engines or unlined for smaller passenger and mixed traffic engines) was issued in November 1956. The next instruction, issued on 25 January 1957, rescinded the previous instruction, and stated that all engines painted green were to be lined out. An additional complexity was that lining was to be applied not only to passenger classes, but also many 'passenger' members of classes not previously lined in GWR days. These included Manors, many of the large Prairies, some small Prairies (e.g. 4564, 4566, 4570, 5523, 5531 and 5542), many 14xx locos, some Moguls (including 4358, 5330, 6301, 6304, 6308, 6337, 6372, 6377, 6389 and 7330), some passenger Pannier (54xx and 64xx 1) tanks, some side (56xx, 66xx, e.g. 6688) tanks, some Collett Goods (2251 class), and the 47xx class. Boiler feed pipes were lined on Halls and Granges, but not for other classes. 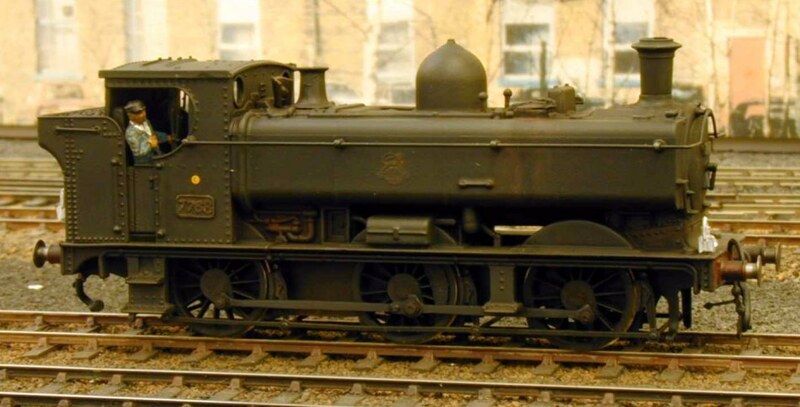 Generally, the upper fender of Churchward 3500g tenders was not lined, but a few were, probably a quirk of Caerphilly. As with the 1948–1956 era, lining was not applied to the rear face of tender bodies. 1 Known examples are 5409, 5410, 5416, 5420, 6400, 6412, 6416, 6418, 6421, 6430 and 6437. The application of unlined green was in two time periods. Firstly, the stage between late 1956 and early 1957 when the rules were changing, e.g. 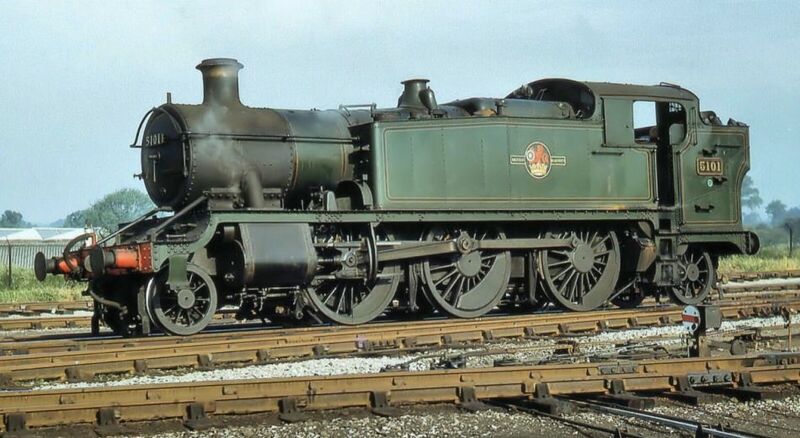 some large Prairies, including 4160, 4121, 5169 and 8103, being outshopped in unlined green from Caerphilly works during 1956–7 with lion and wheel crests. Mogul 6326 is also thought to have been in unlined green in April 1957. The second period of unlined green was the so-called 'economy green' era, and seems to have started possibly as early as 1958 and certainly by 1960. It has been recorded on Moguls 5306, 6320, 6378, and 7304, and was also applied to some large Prairies and 56xx locos. Generally, no effort was made to remove paint from previously painted safety valves, but exceptions to this could be observed – in 1957–8, Caerphilly works polished (as opposed to painted) all brass safety valve covers, even on engines painted black. For locos in green, the valance was painted green. The green valance was also applied to tenders running with green locos. Caerphilly works had a fondness for painting reversing rods red, but was instructed by Swindon to cease the practice in November 1958. Some large Prairies, 2251s and 14xxs were outshopped in unlined green in the late-1950s/early 1960s. After 1958, the numbers of steam locos receiving works attention and repainting declined rapidly, and as a consequence the standard of external cleanliness of steam locos also declined rapidly. Labour shortages at sheds meant that the majority of locos, except for a few express passenger locos, were cleaned rarely if at all. The external state of many locos in their last years was pitiful, with no insignia discernible beneath the heavy grime. 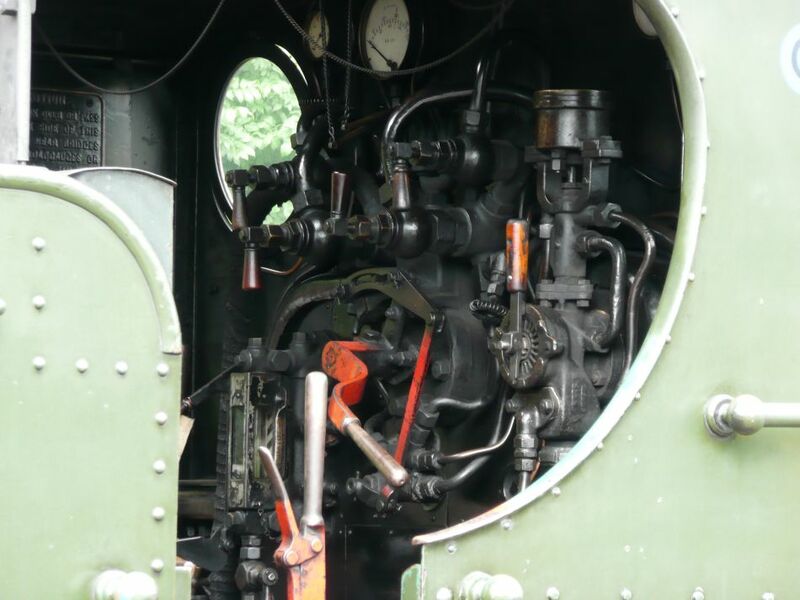 Cylinder lining continued to be twin ⅛" lines, either orange chrome for the green-bodied locos or red for black-bodied locos, but was no longer formed into a panel shape. 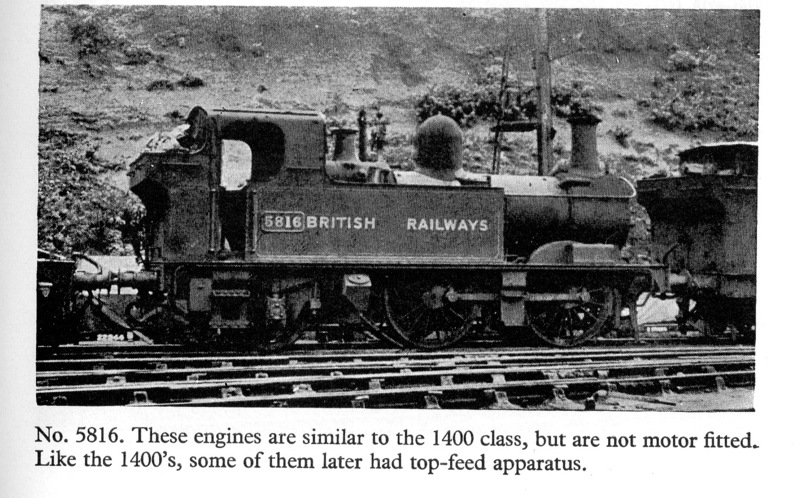 Lining was omitted from firebox bands. 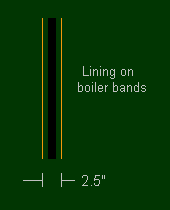 For boiler bands on green-bodied locos, the previous ½" space between the 1" black line and the ⅛" chrome orange lines was increased to ⅝" (see graphic adjacent). No lining was applied to bufferbeams or valances below the footplate. For locos with cab side windows, cab side lining no longer continued above the window. Lining was not applied to the front of cabs. 5973 Rolleston Hall in lined black livery, ex-works at Swindon, showing the cabside and splasher lining, the positioning of the route and power indicator, and the absence of lining on the firebox. Initially, this was in the standard shaded yellow GWR Egyptian font. Examples are 2001, 2089, 2146, 4022, 4025, 4039, 4050, 4160–65, 4229, 4902, 4946, 5022, 5144, 5165, 5197, 5415, 5691, 6126, 6411, 6696, 6697, 6698, 6984, 6986, 7007, 7017, 7224, 7225 and 8738. Later, a 6" Gill Sans font was adopted, but opinions differ as to whether the colour was white or light cream. Examples are 1421, 2100, 2351, 5021, 5169, 5180, 5216, 5236, 5241, 5519, 5645, 5670, 5699, 6001, 6602, 6614 and 6682. 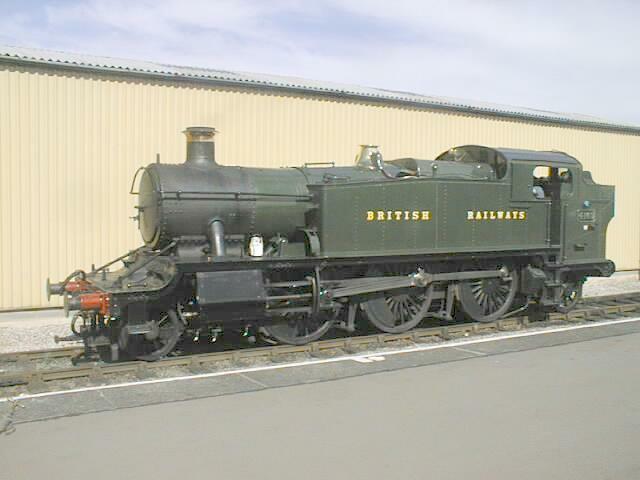 Prior to the availability of the first lion and wheel crests, some large Prairies were outshopped in unlined green, with GWR style numerals on their bufferbeams, and a small (2") white W under the cabside numberplate. The 'W' was applied between January and late March/early April 1948, and it is thought about 150 or so GWR engines received it. 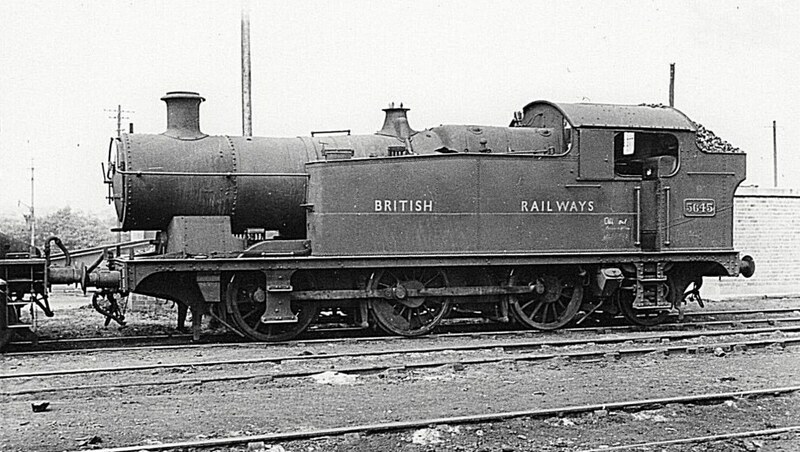 0-6-2T 5645 with white Gill Sans 'BRITISH RAILWAYS' insignia. The safety valve cover should be a tall one, to align with the height of the valves, but a short cover has been fitted. With recently-applied Gill Sans 'British Railways' insignia, and shortly before it was renumbered 438, 309 is a heavily-Swindonised ex-TVR 0-6-2T, originally built in 1914 by Hawthorn Leslie & Co. It was withdrawn in 1953. The BR lion & wheel insignia first appeared (on Castle 7018) in May 1949. Two forms of this insignia were produced, left and right, the idea being for the lion to face the front of the loco. Shortages of the insignia however meant that some locos had lions facing the wrong way round, or the insignia was not applied on occasion if the right form was not available. There were three sizes of this insignia, 26.5" wide, 15" wide and 8.5" wide, although the latter appear to be scarce. The lion & wheel insignia was replaced with the BR 'ferret and dartboard' totem in 1957. Initially, this was also produced in left- and right-hand versions, but a dispute with the College of Arms meant that BR(W) was forced to use only the version it had registered, which was the one facing left. The totem existed in two sizes, 43.75" wide and 30.25" wide. The GWR power and route restriction indicators continued to be displayed, but the 57xx and 8750 class of Panniers were all re-classified in 1950 as 'Yellow' route engines rather than their previous blue category. 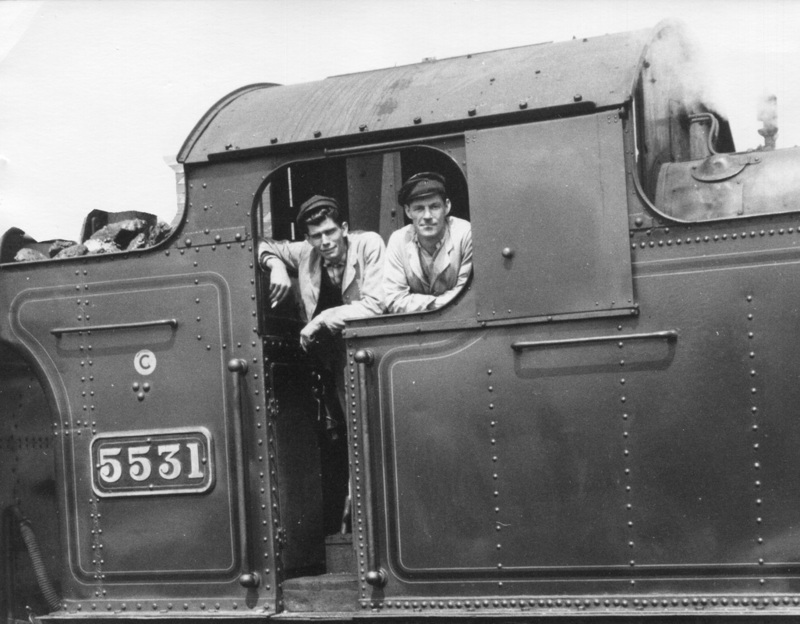 For locos whose indicators had been lowered during WWII, the position of the indicators remained above the numberplate, and they were not raised up to their pre-war position high on the cab sheet. 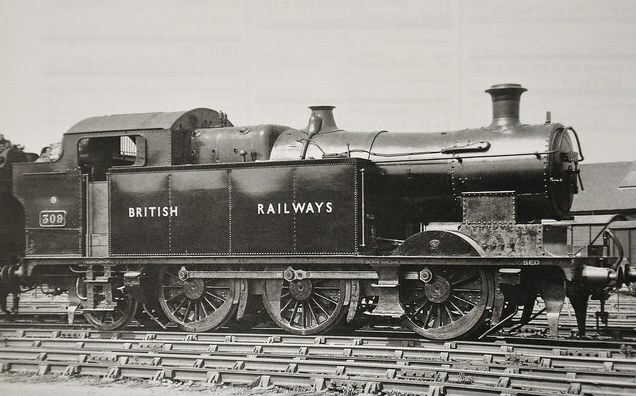 For unclassified weight (uncoloured) locos painted in black, the power class letter was not normally applied: known exceptions to this were 16xx Panniers 1607/8/13/20/23/27/30/31/34/36/38/39/40/43/44/46/47/48/49/51/59/61/64, which had a white A applied, and some early 'lion & wheel' repaints, where the white A had a white circle. Generally the white A did not reappear on post-1957 'ferret and dartboard' repaints. Loco numbers on buffer beams were no longer applied, but were still to be seen for many years after nationalisation. 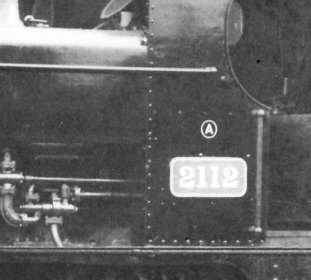 All locos carried steel number plates on the front of the smokebox door, the numbers being in a Gill Sans font. These number plates were in black, with the numbers picked out in white. 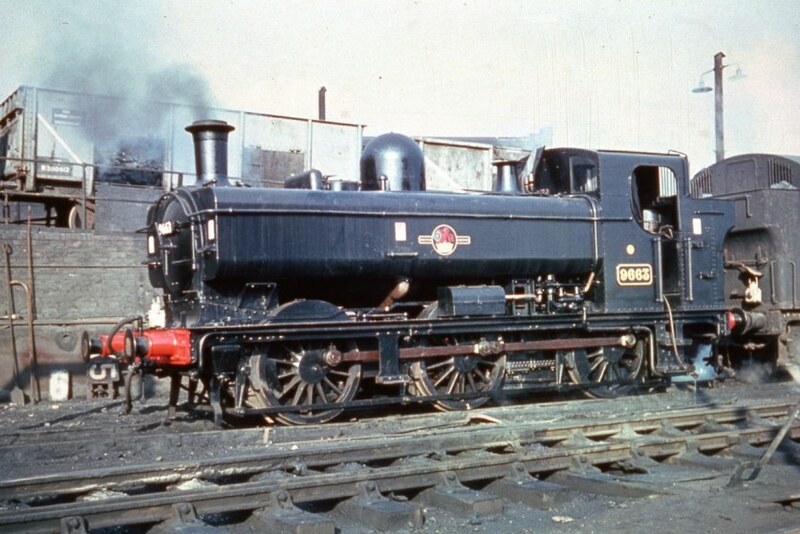 Smokebox plates were generally fitted at the same a loco received its first BR(W) livery; however, some locos repainted shortly before 1948 received smokebox numberplates whilst awaiting their next repaint. Elliptical (7.25" x 4.5") cast steel shed plates were applied to the bottom of the smokebox door, and replaced the three-letter code painted on the front of the footplate valance, which was discontinued from January 1950. The numbers and the rim of the shed plates were picked out in white.